It was another moment of late drama for Tranmere as they secured a 1-0 win over Barrow. Despite endeavour and effort from both sides, the game somehow remained goal-less as the end approached, only for James Norwood to find a way through the Barrow defence to clinch the three points for Rovers. 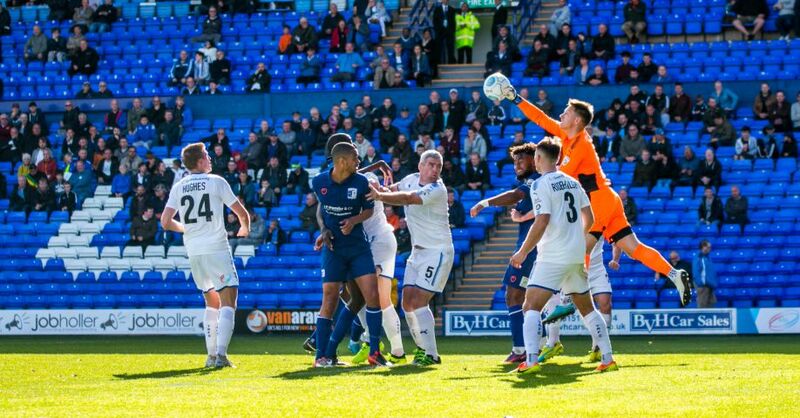 This was a crucial game for Tranmere: sitting in 18th with two wins from their first eight games, Rovers couldn't afford to drop more points, even at this early stage of the season, if they are to mount a serious promotion challenge again. Barrow entered the match in the slightly better position of 16th, but they also realised that a win here could have done wonders for their momentum. Yet neither side could make the break-through, despite both teams having plenty of chances. A close-range header by Andy Cook led to a chance for Jay Harris but he couldn't convert. Around 25 minutes in, Norwood stayed on his feet when he received a tough challenge in the box; Norwood crossed it in low to Cook to no avail, but the question was whether Norwood should have gone down, as he had the right to do, to earn his side a penalty? As half-time approached, Barrow had two great chances: Adi Yussuf cleverly chipped goalkeeper Scott Davies only for James McEveley to clear it off the line at the last second, and Byron Harrison thought he had headed his team in front during added time only for it to be disallowed, after a delay, for offside. The second half followed a similar pattern: Barrow looked dangerous going forward but Tranmere's defence was resilient enough to cope, whereas Tranmere's own threat towards goal lacked that extra bit of punch that would have made all the difference. The most notable chance came from a stunning 45-yard lob by Barrow's Dan Jones, with Davies very fortunate that the ball just reached the outside roof of the Tranmere net. The Tranmere fans became frustrated with what appeared to be significant and frequent time-wasting by the visitors as the closing minutes approached, and the game seemed destined to end as a goal-less draw. Fortunately for Rovers, some hesitation within the Barrow defence allowed Norwood to weave through and drive home a low effort into the bottom corner of the net. Cue scenes of jubilation amongst Tranmere fans, and three vital points. Tranmere are making a habit of late goals at present, not that their supporters will mind one jot. The National League is extremely tight at present; Tranmere, now in 14th, are just five points behind Dover, who currently sit top, with roughly 20% of the season in the record books. Therefore, this win could prove to be pivotal, and if Tranmere do enjoy a run of form akin to that which propelled them to a high finish in 2016/7, it's likely that this win will be considered the catalyst. Tranmere Star Man: James Norwood. With no truly outstanding performances, Norwood gets the nod for his hard work throughout, having created several chances, and of course for his hugely significant late winner.